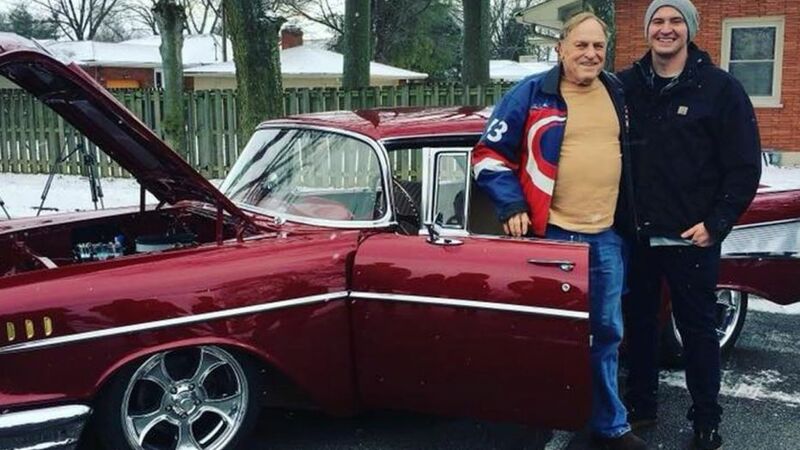 A Kentucky grandfather was reduced to tears on his 81st birthday last weekend when his grandson presented him with a newly restored 1957 Chevy Bel Air that had been collecting dust in a garage. Cameron Dedman wanted to surprise his grandfather and “do it right,” so he said he saved money, sold his own car and worked much of last year restoring the classic. “He’s my best friend and truely deserves it,” Dedman said on Facebook. Fred Lamar, his grandfather, owned the car since the 50s, WHAS reported. Dedman documented the restoration process on Facebook, and did almost all the work himself – from the metal work to the wiring. “I have been doing a full frame off restoration of this car,” he said. Word spread throughout the family about the gift and they all met at a parking lot on Saturday. Lamar was blindfolded. When he removed the blindfold, he saw that the old car he drove his children around in was shiny and red. He tried to collect himself, but began to cry. Some relatives appeared to fight back tears, but Lamar continued to cry and the two embraced. Dedman told the station him and his grandpa plan on showcasing the car at upcoming car shows.